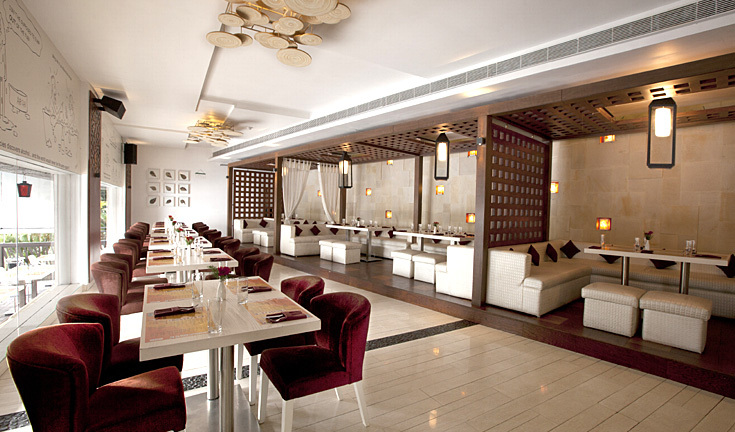 An alluring ambience filled with nature, beckons you at Bay 146 – the bar and kitchen! An element of nature is captured, with pebbles and stone structures that give the feel of rustic and futuristic touch, blending seamlessly with each other. The subdued mood lighting in blue is coherent with the surroundings. The back drop of the onyx bar gives you a view of the landscape that is visual from classy interiors. It also has an open deck with wooden flooring which overlooks the water body. The Resto Lounge is spread across three levels, where the 3rd level faces the swimming pool, 2nd level has the gazebo with cozy seating arrangements and the 1st level comprises the Bar, Band and DJ box. Bay146 keeps the party scene alive in Chennai with frequent events music events – DJ Nights, Band Performances and Stand-up Comedy Nights!